Second completely revised edition, April 2006. 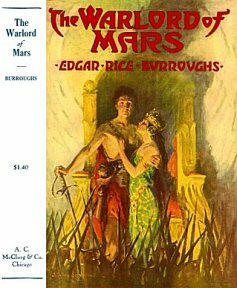 This article is an attempt to create an accurate chronology for the Mars series by Edgar Rice Burroughs. 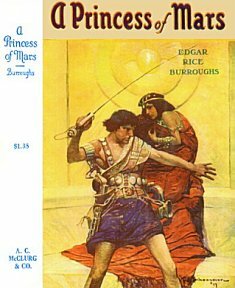 The series begins with the novel A Princess of Mars (for the rest of the article referred to as PM). 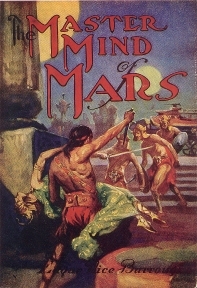 The two following books are titled The Gods of Mars (GM) and The Warlord of Mars (WM). These three books form a completed trilogy. There are eight more books in the series, but only The Master Mind of Mars (MMM) can be linked to specific Earth dates. The construction of the chronology has not been without problems. Burroughs was always a vague and suggestive writer, leaving much to the imagination of his readers. He was sometimes also both inconsistent and even illogical. It has therefore often been necessary to make a choice between two or even more different lengths of time for various activities. It can perhaps be wondered, in the light of all of Burroughs' inconsistencies and errors, whether the creation of a chronology is worthwhile at all. Regardless of what results we arrive at, they will always be open to interpretation, and so would seem to be of little value. My personal opinion is that this is the very reason why it is important to carry out this study. It gives an opportunity to find and scrutinize the temporal inconsistencies in a more structured manner. This is the second, completely revised, version of this article. Since making the first version, I have had many reasons to reconsider my original decisions, and hence the results will be somewhat different. The first version only included the first three books. Other than that, the greatest difference, at least from my own perspective, is that this time I have created an Excel spreadsheet for taking care of all calculations. This has allowed me to play around with different values to see how the outcome is affected. This Excel document can be downloaded (see below), allowing you to test different hypotheses and play around with the values yourself. It has sometimes been necessary to guess whether Burroughs refers to Earth time or Barsoom time when he uses terms like "month" and "year." I have assumed that one week means seven Barsoomian days and that one month means thirty Barsoomian days. The situation becomes more complicated when it comes to counting years. Burroughs only rarely specified whether he referred to Earth years or to Barsoomian years. In this chronology, the choice between these two options has been made on a case-to-case basis. As a rule of thumb, I have found that Burroughs mostly appears to refer to Earth years. In the first version of this chronology I used the values that Burroughs quoted in his novels for the lengths of the Barsoomian year and day. Those values, however, were largely based on misunderstandings of astronomical facts. In this version I have decided to provide values for both the scientific figures (using scientific year and solar day) and for the most commonly cited values in the books (incorrect year and approximate sidereal day). For a detailed discussion about the various options for length of year and day on Barsoom I refer to the article Martian Measurements of Time by Ekman and Gangale. Another difference from the previous version is that this time I have chosen not to consider the quote that John Carter was on Mars for "five years and ninety-six days of Martian time" (GM/20), since it is shown in the abovementioned article that this figure is based on an erroneous calculation. Instead I have assumed that Carter was on Mars for exactly ten Earth years (plus a few hours, as governed by the time of day on Barsoom upon his return), which is probably what Burroughs intended in the first place. In MMM, I have also used the orbit of the moon Cluros to more precisely define when some events take place. In the series, Burroughs quotes two inconsistent durations of the Cluros orbit, neither of which is scientifically correct. I found that a quote from The Chessmen of Mars, where it is stated that Cluros completes one half orbit in "eight zodes" (CM/3), gives a good match for the observations of Cluros that are mentioned in MMM. A quote stating that Cluros makes a complete revolution in "something over thirty and one-quarter hours" (PM/5) does not work for this purpose, and neither does a scientific figure. Unlike PM and GM, MMM does not mention the specific date when the hero (Ulysses Paxton in this case) travelled to Mars. Even so, it is possible to calculate a relatively accurate date. The novel begins with "A Letter," which is dated "June 8th, 1925." This is of little help. At first glance, it would seem to be connected with the final chapter of the novel. The letter was written in Helium, and that is where Ulysses Paxton eventually journeys. But the letter must have been written several years after that visit. More useful is the information in the same letter that Paxton "died" in France during World War I. This means that he must have come to Barsoom before the armistice, which was on November 11th, 1918. The US declared war on Germany in April 1917. But US troops did not see action on a regular basis until the end of May 1918. Judging by Paxton's letter, he seems to have been fighting in the trenches for at least several weeks before he was killed. Therefore, it appears that Paxton was probably not killed before July. On the night of his death, Paxton viewed Mars as a "bright red eye." In fact, during all summer and fall of 1918, Mars set shortly after sunset and was therefore difficult to observe -- in particular with Paxton laying "within a shell hole." At the time, Mars was moving away from Earth, so it was significantly brighter in summer than in fall. It was also higher in the sky. In July, the short summer nights gave few opportunities for observation, so Paxton's best chance of seeing his "planet of destiny" was in August. Paxton also saw how "the moon came out from behind a cloud" and lit up the surroundings. Since the moon was apparently very bright at this late hour, it must have been half to full, probably nearer full. The full moon was on the 22nd in August. Give or take a week for a span of August 15th -- 29th. However, after the 25th the moon and Mars were not both in the night sky at the same time. We can therefore conclude, with a reasonable degree of certainty, that Paxton left his earthly life and arrived on Barsoom during the eleven-day span of August 15th through August 25th. For the purposes of the chronology, I randomly assume August 20th. The time of each activity is given both as Barsoom time and as Earth time. The Barsoom time is given in Barsoomian ords (years) and padans (days) since John Carter's first arrival on Barsoom. Earth time is given as a Gregorian date. Dates shown are in Mountain Standard Time for PM, Eastern Standard Time for GM and WM, and Central European Time for MMM. No allowances have been made for Daylight Saving Time. Time zones on Barsoom have not been considered, partly because John Carter's activities near the poles make any attempts in that direction futile, partly because few maps of Barsoom are in agreement regarding longitudes of major cities. Each event is briefly described and to the right thereof is a column for references to the chapters where the events occur. For some events there are references to notes with further discussion. Unless otherwise specified, all events refer to the hero of the book (John Carter or Ulysses Paxton). With a few rare exceptions, I have only given one event for each day. Be aware that some seeming inconsistencies between Earth time and Barsoom time may be caused by the fact that time of day has been taken into consideration. For example, it follows that even though arrival at Thark and escape from Thark occur on the same day Barsoom time, they are at separate dates Earth time. 1. The date March 5th is easily arrived at by a careful reading of the first two chapters of PM. It is clear that John Carter left his earthly life behind some time around midnight on the night preceding the 5th of March. Burroughs later seems to have been confused about this (see note 12). A problem with this date is Mars, which John Carter describes as "a large red star close to the distant horizon" (PM/2). However, Mars did not rise until nearly six o'clock in the morning. I have chosen to ignore this fact. 2. Burroughs gives several references for the extent of the stay in Korad, all conflicting to some extent. The time here presented is in accordance with my article "The Duration of John Carter's Stay in Korad: A Contradiction". 3. 34 padans from John Carter's arrival to this event is contradicted in the novel by the statement that Thark was entered "thirty days after my advent upon Barsoom" (PM/16). That statement, however, is based on an erroneously calculated stay in Korad (see note 2). In addition, the figure 34 makes sense in the light of a later statement that Kantos Kan reached Helium "about the time of our coming to Thark" (PM/19). 4. The chain of events following the arrival at Warhoon is in a way the most problematic passage in the entire novel. John Carter cannot even say whether he lay imprisoned for "days, or weeks, or months" (PM/18). Two clues prompted me to assume the relatively short passage of time (seven days until the murder of his jailer) recorded here. One is the time of Kantos Kan's arrival (see note 5). The other clue is the fact that the Warhoons after a delay of only three days on the march feared that they would not be able to return in time for the great games. If we assume that the Warhoons were marching for Thark, then we know that they were no more than three days' march from their goal (since that is how far John Carter had marched with Dejah Thoris and Sola), so the expedition were only supposed to take nine more days (three days to Thark, six days back) plus time accounted for delays and battle. It is probable that the games were scheduled to start within or slightly later than ten days after the march back to Warhoon was commenced, that is about 50 days after John Carter's arrival on Barsoom. Since we do not know at what day of the games John Carter fought, however, we can allow for some slack and the present assumptions are consequently not unlikely. 5. After arrival at Helium (see note 3), Kantos Kan spent an unknown amount of time with the navy of Helium searching among the northern tribes and in the process wiping out two entire communities of green men. The fourteen days assumed here would, I think, be a minimal time for that activity. At any rate, it should not have been more than 25 or 30 days. 6. It is stated that the Tharks were feasted for ten days (PM/27), although it is not clear whether the first night after the battle is included in this figure or not. I have here assumed that it is not. 7. The time here given assumes that the errors of the previous uncertain times balance one another. At worst, it could be 13 days less or about as many more, depending on the correctness of my guesswork. It is also interesting to note that although John Carter often states that he was in the service of Helium for nine years, his adventures up to this point actually took less than five months. This could be interpreted in several different ways. Either, he mentioned nine years as an extremely approximate figure (in reality being closer to ten years), or he did not enter the service of Helium immediately after his marriage (which seems unlikely). A third alternative is that I gravely underestimated the time during which he was a prisoner of Warhoon (see note 4). Finally, it is possible that his total stay on Barsoom was less than ten years. 8. Carthoris' egg had been laid "nearly five years" before the atmosphere factory incident (PM/27). I would normally assume five Earth years, except this should be the same period as for the green men's quinquennial hatching traditions (which must logically be Barsoomian years). This works well as long as we use scientific years and days. In that case, the laying is about two and a half months after the marriage, which may or may not be a normal Barsoomian "pregnancy". If quoted days and years are used, however, then assuming five Barsoomian years will mean that the egg-laying occurs before the wedding. The expression "nearly five years", however, allows me to assume four and a half Barsoomian years for the second table, which works quite well. This probably means that Carthoris was prematurely hatched. 9. At the coming of John Carter to Dor (see note 12), Thuvia had been a slave for fifteen years (GM/4). I have here assumed eight Barsoomian years, which was later recalculated (by John Carter or his editor) into approximately 15 Earth years. This gives an exceptionally good match for the scientific figures and works decently for the quoted figures. 10. John Carter saves Barsoom and passes out late in the evening on Barsoom. The corresponding time of day on Earth is about 7 a.m. for the scientific figures and 2 a.m. for the quoted figures. In the novel, it is night when John Carter awakens on Earth (PM/28). In order for the scientific figures to work, we must therefore assume that he lay unconscious for the entire day of his return. 11. Carthoris saw the face of Issus nearly one year before he first met his father (GM/10). In this case, it has to be a Barsoomian year. We do not know the exact date, of course. 12. Burroughs is very careful to point out in his foreword to PM that John Carter dies (and consequently goes to Barsoom) on the night before the 4th of March. He apparently meant this to be exactly (probably to the hour) 20 years after the first passage. Unfortunately, the first passage was actually on the 5th of March (see note 1). Accepting this slight inconsistency we find that John Carter arrives on Mars in the middle of the night, assuming scientific days and years (quoted days and years give a correct arrival around mid-day). This is inconsistent with the novel, but that should not bother us greatly. After all, we do not know exactly in what time zone he arrived. And speaking of time zones, it is interesting how, this close to the pole, day and night seem to go on just like anywhere on the planet. We must assume that John Carter happened to arrive at a convenient period of solstice, which also happens to be the case whenever in the future he visits the areas near the poles. 13. After having picked up John Carter, the Xavarian made the journey back to Helium in only a couple of hours, which does not seem very likely. Of course, we shall have to accept what Burroughs writes. 14. John Carter had calculated 300 days of confinement up to this point. After his escape, however, he realised that he had counted 35 days too few. I have chosen to account all 35 days to this first part of his imprisonment. Note that the uncertainty of this date does not affect the dates following in the rest of the book. 15. Here again the journey of the fleet is extremely swift (compare note 13). The events after the battle are also questionable. The heliumetic fleet does not enter Omean until after dark and they apparently reach the temple before dawn. Within that time they descend the shaft (which should be rather slow work with a fleet of five hundred), defeat the remaining forces, take over the submarine, plug up the shaft and travel the subterranean passages to the temple. All this should leave at most two zodes for transporting the troops (five thousand strong) with the submarine. If we assume a capacity of 125 men, then each return trip (including embarking and disembarking) would have to take less than seven and a half minute. 16. We are told that half the year from Dejah Thoris' imprisonment had passed, "or would on the morrow" (WM/1). The problem with this is that half a year is 334.5 scientific days or 343.5 quoted days, so if half a year were to have passed on the morrow, then it had already done so in the evening. It is probable that John Carter is referring to a date in some Martian calendar, the structure of which we know nothing about. I have assumed that 334.5 or 343.5 days respectively have passed when the book begins. 17. The initial chain of events in the book is problematic, mostly because it is set in underground passages, so no indication of night or day is given. I feel, however, that the approximations here given are reasonable and that the margin for error stays within one day. 18. This time is uncertain, because we do not know how long the passage through the 27 chambers of the carrion caves took. Since it was day when the caves were found, and day again when Talu and his would-be assassins were spied, it is reasonable to assume that the passage took one night. 19. There is no indication as to the length of time spent in Kadabra waiting for this event. The ten days here quoted is a pure guess. 20. The duration of the stay in Ptarth is cited as one month and I have as always assumed 30 Barsoomian days, plus two days for the flight from Kadabra. 21. Before returning to Helium, the company stayed for an unknown period in Kaol. This period, however, must have been very brief, for when John Carter sees Thuvan Dihn in the Temple of Reward, he remembers having seen him in Ptarth only "a few days since" (WM/16). 22. The date of Paxton's death on Earth, and consequently of his arrival on Barsoom, is not certain, but my guess is probably no more than five days off the mark (see my reasoning above). I have assumed departure from Earth at 9 p.m. CET, not considering DST. At that time, there was still some twilight and Mars should barely have been visible, a mere five degrees above the horizon. 23. This and the following events have been calculated backwards from the night that Paxton and his companions hid aboard a flier (see note 27). 24. Ras Thavas started spying on Paxton after he had concluded his investigation, which was at least several nights after the previous event, but probably not much more than the three days here assumed. This guess is reinforced by the setting of Cluros, which is mentioned in the text (MMM/5), and which fits well with the setting of Cluros as Paxton leaves the palace of Mu Tel (MMM/9), as well as other Cluros sightings in the book. 25. Paxton waited for "about two of our months" (MMM/6) until Ras Thavas' spies left him alone. Only then could he start preparing for his plans. 26. Paxton worked late for "weeks" (MMM/6) before making the operations. I have taken three weeks as a reasonable assumption. 27. This event was "almost an Earthly year" (MMM/6) after Paxton came to Ras Thavas' laboratories. I have guessed 350 Barsoomian days. 28. The concluding events cannot be exactly specified by date, but probably occurs within one year's time after meeting John Carter, so some time during 1920. It ends with the honeymoon trip "to Helium, where I am writing this" (MMM/14). Yet the letter that begins the book is dated several years later; "Helium, June 8th, 1925." It appears that the manuscript must have been written at a much earlier date than the letter. Either that, or living his life by a Barsoomian calendar had completely screwed up Paxton's sense of time. After all, it seems totally unlikely that Paxton's honeymoon was five years long! The above tables have been produced using an Excel spreadsheet. If you disagree with my assumptions, or if you just want to play around with different values, then you will want do download this document. Unfortunately, it requires the add-on Xdate. Xdate has been tested on several different versions of Excel, but I cannot guarantee that it works on all. Please contact me if you encounter any problems. The spreadsheet also contains data for the Marvel comic book series. These are not canonical, and can be ignored if you do not care for them. Important! Download the Xdate add-on and install it according to the accompanying instructions. Download the Zip file MarsChronology.zip. Open the document MarsChronology.xls and enjoy the experience! I would like to extend my thanks to Bruce Bozarth and Thomas Gangale for the long and interesting e-mail conversations, which prompted me to complete this revision. I would also like to thank Dennis Wallentin for introducing me to Xdate, my wonderful toy and life saviour. Finally, my deepest gratitude to my princess Anna Torstensson for all the patience. The tables have been based on the following books in the Martian series by Edgar Rice Burroughs. 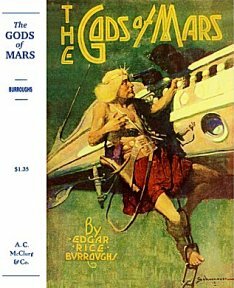 References are given using the same standard as in J. F. Roy's A Guide to Barsoom, with abbreviation of the title and number of the chapter where the quote is taken from.